Main Street Capital (MAIN) is a business development company, or BDC. All BDCs are basically middle market lenders, which means they lend or take equity stakes in the 200,000 or so subprime businesses that generate about a third of the U.S. economy. 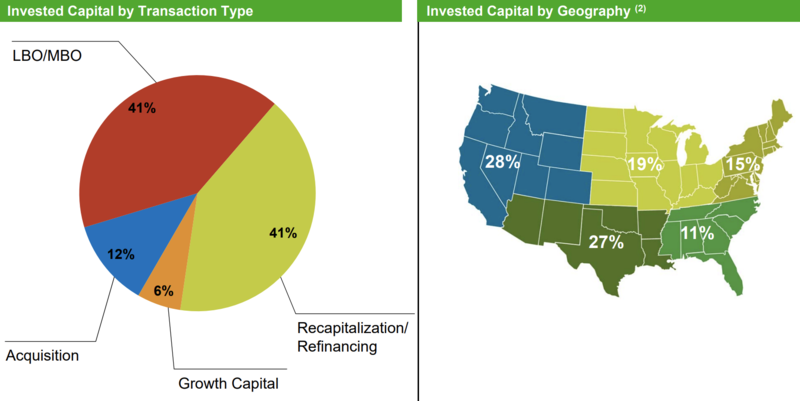 Essentially, BDCs serve a market of small companies across the country that regular banks don’t want to touch, helping those businesses fund acquisitions, leveraged buyout (LBO) transactions, recapitalizations, and growth projects. Main Street is a medium-sized BDC with over $4 billion of investment capital under management. The firm deals mostly with lower middle market companies that have annual revenue between $10 million and $150 million and EBITDA ranging from $3 million to $20 million. 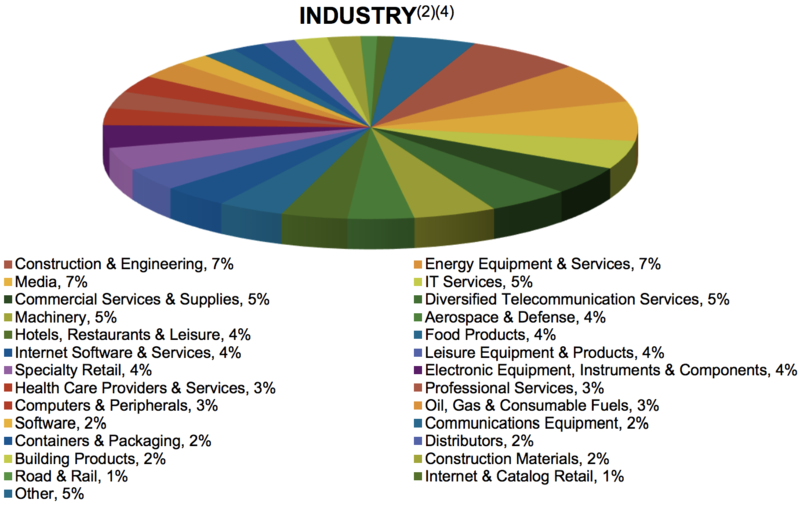 Main Street’s portfolio consists of loans and equity stakes in 182 companies diversified across a wide range of industries, none larger than 7% of the total portfolio. With its average loan only $11.5 million in size, Main Street’s cash flow is relatively well protected against a failure of any one of its clients. In fact, its single largest loan represents 2.3% of its portfolio value and generates 6.8% of its total interest income. 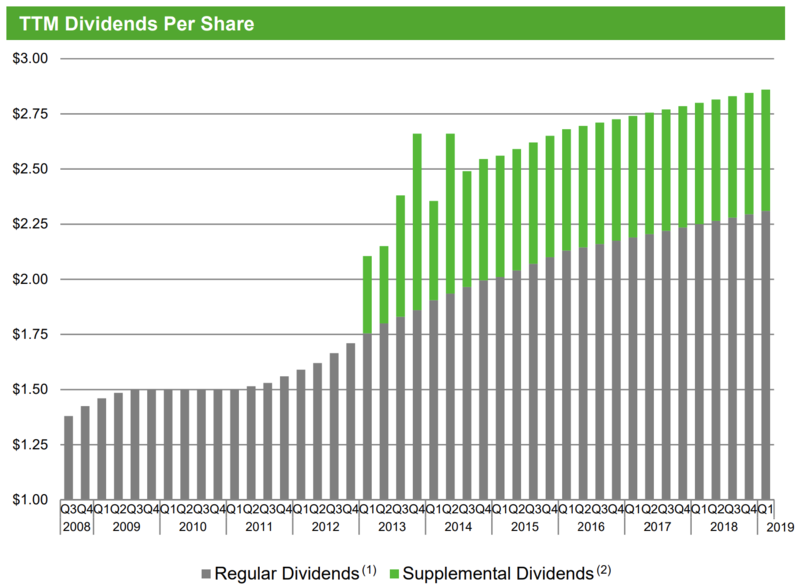 Main Street is one of the oldest BDCs in America and has paid uninterrupted dividends for 11 consecutive years while raising its payout for eight consecutive years (the best dividend track record in the industry). Main Street has enjoyed excellent growth in its portfolio, investment income, and distributable net investment income (which funds the dividend) in recent years. In fact, since its 2007 IPO (right before the financial crisis), Main Street’s portfolio investments per share and distributable net investment income per share have each risen by more than 200%. Thanks to this growth, Main Street’s monthly dividend has increased by about 5% annually during this time, the best long-term growth rate in the industry. However, the last decade has been unique in that the Federal Reserve has kept interest rates at their lowest levels in history, greatly expanding the money supply while limiting the number of risky loans that major banks are allowed to make. In other words, the BDC industry as a whole has been living in a golden age of relatively little competition from big banks, very cheap borrowing rates, and a world awash with cash and investors desperate for anything with a generous and growing dividend (which made it very easy to raise equity capital). That being said, Main Street is different from its increasing number of rivals (there are more than 100 BDCs in the U.S.) because its management is far more disciplined and skilled at which investments it makes on behalf of shareholders. That’s largely due to the fact that Main Street is one of the few internally managed BDCs, providing a meaningful cost advantage compared to its rivals. Externally managed BDCs use management contracts with third parties that result in higher fees and thus make steady growth in key metrics such as distributable net investment income and net asset value per share more challenging. Unlike those firms, Main Street’s management team actually works for and owns a large percentage of Main Street itself (over 5% of the company). As a result of its efficient organizational structure, Main Street has much lower operating costs and higher profitability compared to its BDC and bank peers. Specifically, the firm’s operating expenses as a percentage of assets are 1.5% compared to an average of 2.6% for commercial banks and 3.1% for externally managed BDCs. Better yet, those operating cost advantages result in substantially higher distributable net investment income (DNII) per share, which makes for more secure and faster-growing dividends over time. 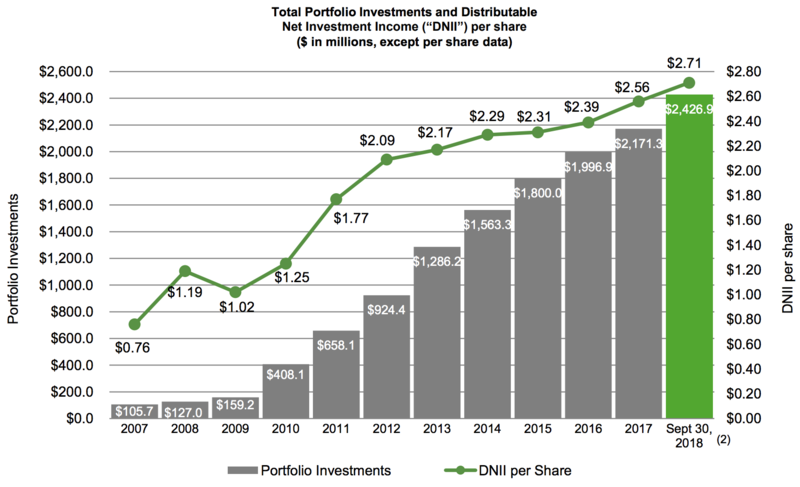 While most BDCs struggle to grow DNII/share (and thus dividends) at all due to frequent share dilution to raise growth capital, Main Street has rewarded investors with the industry’s best track record. 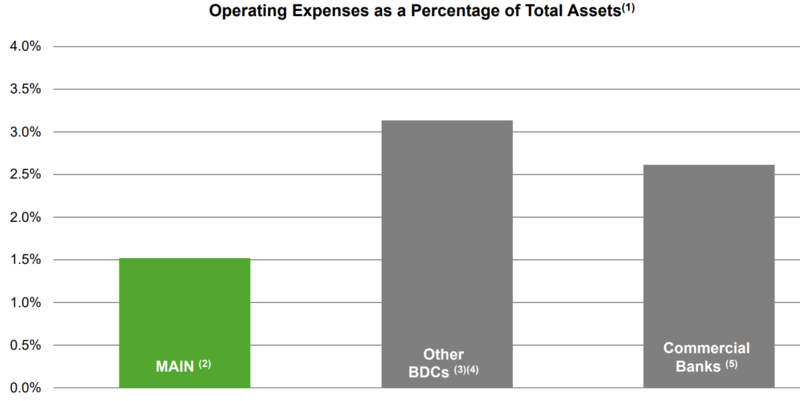 As you can see, regular dividends have never been cut, even during the Financial Crisis, and since 2013 the BDC has paid a supplemental dividend (the green bars) every six months out of investment gains and dividends paid by its investments. This impressive track record is made possible by Main Street’s competitive cost advantage which translates into safer lending practices. For example, since most rivals have higher cost structures, they are pressured to “reach for yield” by making riskier loans to smaller, more leveraged and financially fragile companies. Such loans can sometimes carry interest rates well above 12% but provide minimum protection to the BDC in case the company becomes distressed and defaults. In contrast, Main Street is able to generate positive lending spreads (interest rate on its loan book minus its cost of capital) with safer loans issued to less leveraged companies. Most of Main Street’s loans have an average interest rate between 8% and 12%, reflecting the firm’s relatively more disciplined underwriting compared to peers. Importantly, the vast majority of its loans are also “first lien,” meaning they are backed by the company’s assets. Therefore, in the event of a default or bankruptcy, Main Street is first in line to be repaid out of asset sales. 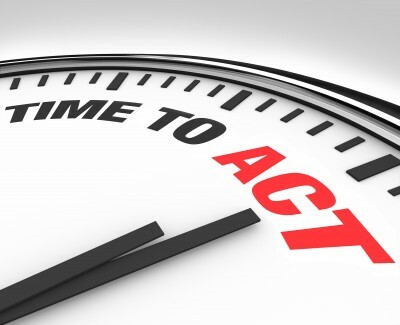 While lending to healthier businesses at lower interest rates and focusing on first lien debt may mean less investment income in the short term, such conservatism will likely prove to be an advantage the next time the economy turns south and small businesses start defaulting on loans. Besides providing debt capital, Main Street often takes high equity stakes (stock ownership) in the lower middle market companies it works with, which account for nearly half of the firm’s total investment portfolio’s value. The firm owns equity in 99% of these portfolio companies with an average ownership stake of 39%. As a result, Main Street can help provide management guidance to its clients to help them grow their businesses. If successful, the BDC benefits from its customers’ success over time by enjoying capital appreciation on its investment and higher dividends. Currently, about 15% of Main Street’s income is being generated by dividends from these equity investments. “We are now in a position due to the size, diversity, and maturation of our business model to begin the conversion of our supplemental dividends and the regular monthly dividends. We envision making this transition over the next five years such that by the end of the transition period our monthly dividend payout rate will be at least $0.05 per month higher than our current payout rate or at least $0.60 on an annualized basis while currently our supplemental dividends of $0.55 per year will be reduced incrementally and fully absorbed into our monthly dividends. Simply put, by 2024 Main Street hopes to increase its regular dividend from its current rate of $2.34 per share per year to around $3 per share. That would incorporate the 55 cents of annual supplement dividends it’s been paying while also still maintaining roughly 2% to 3% annual growth in its regular dividend, consistent with its historical growth rate. In an industry where it’s rare to see any dividend growth at all, Main Street’s clockwork-like payout growth makes it stand out. 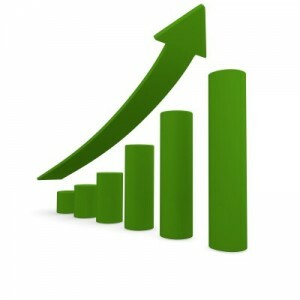 Main Street feels confident it can achieve its dividend growth goal in part because, over the long term, the firm’s higher profitability compounds into better returns on shareholder capital, which ultimately results in strong growth in net asset value (NAV), or book value per share (Warren Buffett’s preferred measure of performance for Berkshire Hathaway). That’s an important point because the BDC industry is essentially a subprime banking industry, meaning that over time share prices track changes in book value per share, which serves as a proxy for a bank’s value (the difference between the value of a bank’s assets and its liabilities). 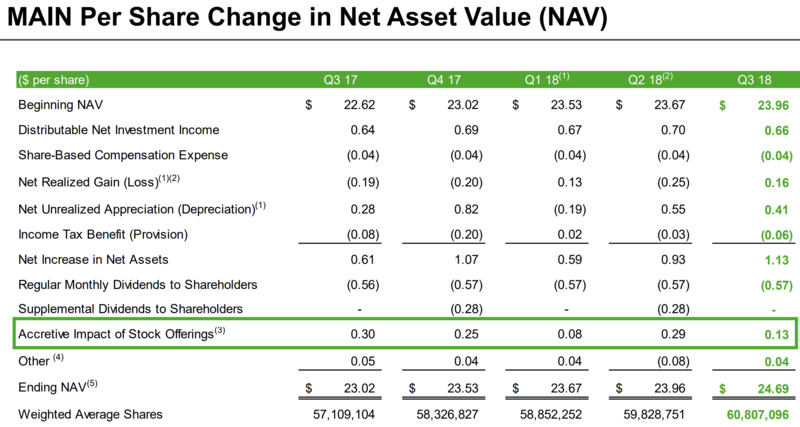 As you can see, while Main Street’s NAV per share has seen periodic volatility, especially during recessions and more recently the oil crash (which decreased the value of its energy-related investments), in general, the book value of the company (dark green line) has been rising steadily. In fact, since its 2007 IPO, Main Street’s NAV per share is up over 90%, the best growth rate in the industry. This is in contrast to most other BDCs, which have external management structures that provide incentives for management teams to grow the size of their firms’ portfolios at almost any cost, even if it requires funding this growth by excessively diluting their shareholders with equity offerings. Since BDCs are required by law to pay out 90% of their taxable income as dividends to avoid paying taxes at the corporate level, they can’t retain much cash flow to fund growth. Therefore, they rely on external debt and equity markets to supply growth capital. By law the maximum amount of leverage (debt/equity) BDCs can have is 2:1, meaning that they can only borrow $2 in debt for each $1 in net assets. This 2:1 leverage ratio (up from 1:1) was passed by Congress in early 2018. But while higher leverage can boost NAV and DNII per share during good economic times, higher leverage also exposes BDCs to greater loan losses; any BDC that uses such high debt levels is potentially more dangerous to own during a recession. BDCs are frequently selling new shares to raise growth capital and make new loans. 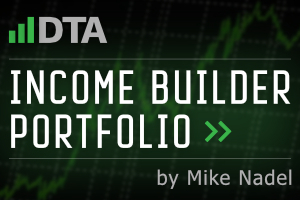 The danger with this model is that each new share is like a perpetual bond, raising the cost of the company’s dividend and making it harder to secure and grow the existing payout over time. When combined with the industry’s meaningful use of leverage, lower quality borrowers, and sensitivity to the economy, it’s no wonder why the BDC industry can be such a challenging one to do well in over time. Investors need to be very selective, trusting their hard-earned money only to management teams that don’t have incentives to grow the BDC (and their management fees) at the expense of shareholders. One way investors can identify such firms is to carefully watch the long-term trend in NAV per share (i.e. a rough estimate of the intrinsic value of the BDC’s shares). This should rise over time if the company is being disciplined in the loans it chooses to make. And as we’ve seen, Main Street’s long-term growth in NAV per share is impressive. The firm’s exceptional track record has made it a darling of Wall Street, allowing management to issue equity at attractive valuations to continue profitably growing its loan book. In fact, between the third quarter of 2017 and the third quarter of 2018 Main Street’s share issuances added $1.05 to NAV per share, while loan performance (appreciation) added another 62 cents. Essentially, in the BDC industry “winners keep on winning” because the most trusted blue-chip names end up with the lowest cost of capital, and are thus able to invest not just profitably (ensuring ongoing growth), but with less risk. Not only does Main Street’s track record show that management has its interests aligned with those of regular investors, but the firm is known for taking a long-term approach to running its business in other ways. Specifically, Main Street has always had a conservative approach to debt. For example, the company’s net debt/equity ratio is 0.6, far below the legal limit of 2.0. 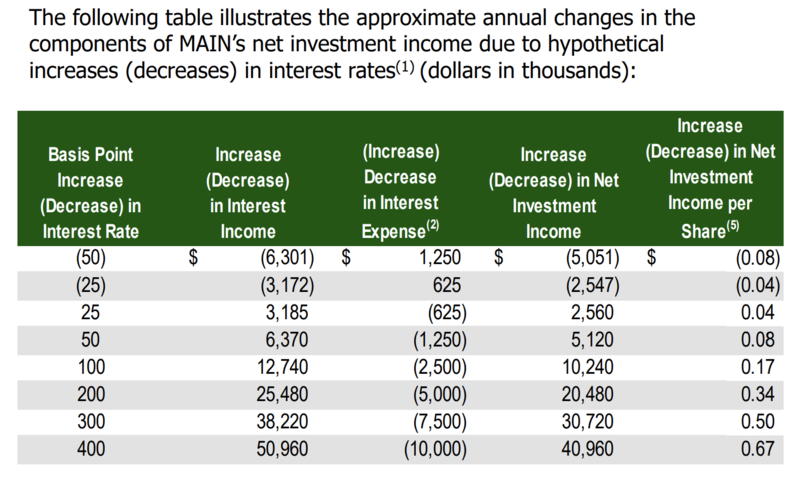 While many other BDCs want to use leverage as much as possible to increase their portfolio size (and management fees), Main Street’s safer debt levels help to lower its borrowing costs. In fact, Main Street is one of the few BDCs with an investment grade credit rating (BBB). It’s also worth mentioning that Main Street has positioned itself reasonably well in the event that interest rates rise. Approximately 74% of Main Street’s debt obligations have fixed interest rates, limiting the potential increase in interest expense. Meanwhile, 72% of the loans it makes to small businesses have floating rates, so the firm’s net investment income could potentially rise significantly if rates increase. Even better, because of the lower risk profile of its portfolio book, Main Street doesn’t have to worry as much about the rising yields on its loans creating undue financial stress on its clients. The same isn’t true for many of its externally managed rivals, which have been reaching for yield in recent years and have lower quality portfolios that are at higher risk of large defaults during the next economic downturn. Overall, when it comes to the higher risk BDC industry, Main Street stands apart as the only blue-chip. Since going public more than a decade ago, the firm has never cut its regular dividend but rather grown it steadily thanks to conservative lending practices. However, there are still a number of risks to keep in mind. While Main Street Capital’s relatively conservative and disciplined management team means that it likely represents one of the best BDCs, it still comes with a higher amount of risk compared to many other dividend stocks. That’s because, while Main Street’s portfolio of loans and investments is less risky than that of most BDCs, the majority of its clients are still B or BB rated (or unrated) companies. What’s more, the average leverage ratio (debt/EBITDA) for its lower middle market clients is 3.0. For context, a leverage ratio of 3.0 is considered the high end of the safe range for investment-grade corporations. For small, junk bond-rated (or unrated) companies, it’s riskier territory. In other words, the BDC industry is essentially a subprime junk bond market, resulting in higher risks of loan defaults and even bankruptcies during an economic downturn. Now the good thing about Main Street is that as one of the oldest BDCs (the company went public in 2007), we know that management is able to guide the business through a major recession (e.g. 2008-2009). However, while the Great Recession was very severe, it was also fairly short-lived thanks to rapid responses from the U.S. Treasury and the Federal Reserve. 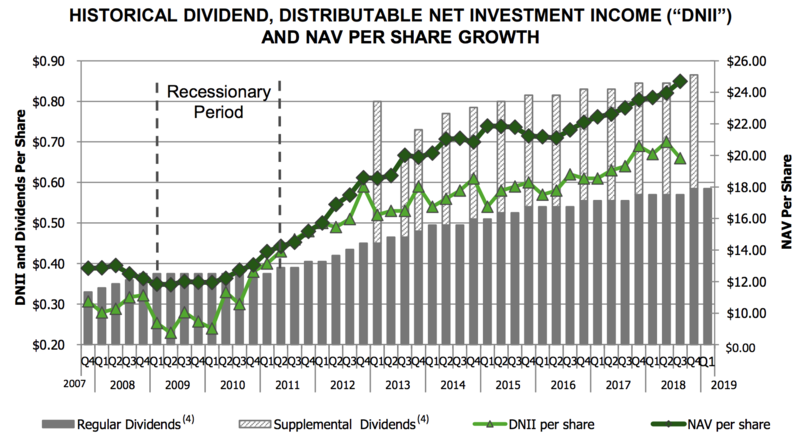 A more protracted downturn could result in more severe declines in DNII, as well as capital gains and dividends from its equity holdings in its clients. What’s more, the high amount of floating rate loans means that the BDC’s effective interest rates on loans will fall during a recession when interest rates decline. Impressively, in the first quarter of 2009 (the peak of the financial crisis) the BDC had just one non-performing loan which represented 0.5% of its portfolio value. That compares to today’s five non-accrual loans which account for 1.2% of the portfolio. Main Street’s portfolio has grown about 30 times in size since the financial crisis, so that doesn’t necessarily mean the firm is making more dangerous loans today. However, this highlights the fact that it’s possible that Main Street sailed through the Great Recession relatively unscathed because management may have simply gotten lucky, by making the right loans to the right companies before the crisis began. Fortunately, according to JPMorgan Asset Management, the average recession since World War II has lasted about 12 months and seen the economy contract by 1.9% (1.7% excluding the Great Recession). That’s about half the 4% peak GDP decline we saw in 2007-2009, meaning that many of Main Street’s customers should make it through a typical downturn without triggering a massive spike in non-performing loans. However, remember that 15% of Main Street’s income comes from dividends in its equity positions. Those are almost certainly going to take a hit during a recession, so its important that management continues to run the business with conservative leverage to keep a margin of safety for its own dividend. To that end, there is risk that management’s plan to gradually convert Main Street’s supplemental dividend to a regular dividend might not work out. The firm’s supplemental dividends have been funded with investment gains and dividends, which could evaporate if a recession occurs before the conversion is complete. But even if the next recession comes after the conversion is fully phased in, Main Street will have a larger regular dividend to support going forward. If the business is not as resilient as management expects, it could have less financial flexibility during the next downturn, especially since the regular dividend will presumably need to be partially funded out of less stable capital gains and dividend sources. 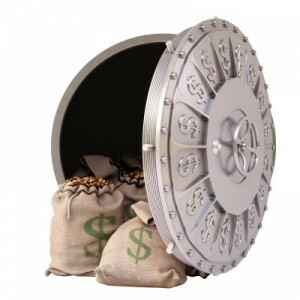 Essentially, while management’s dividend conversion plan appears shareholder friendly at first glance, it adds some uncertainty regarding just how safe Main Street’s regular monthly payout will be during future economic downturns. Main Street’s blue-chip status among its peers is thanks to its regular dividend surviving a recession, something no other BDC has managed to accomplish (most BDCs went public after the financial crisis). However, keep in mind that Main Street’s dividend track record may be harder to maintain in the future. As long as you understand that all BDCs are relatively higher risk stocks due to their subprime lending business model and reliance on external capital markets, then Main Street Capital can make for a reasonable addition to consider for a diversified dividend portfolio. After all, Main Street’s long-term future is arguably among the brightest of any BDC. 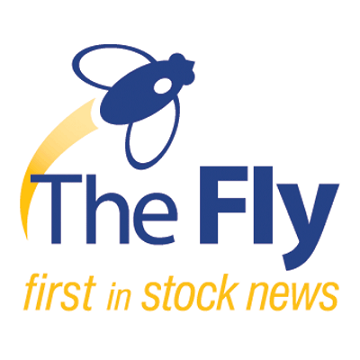 Such optimism appears to be supported by the firm’s numerous competitive advantages, which include one of the most experienced, shareholder-friendly and disciplined management teams; a low-cost business model; a well-diversified investment portfolio; and an unbeatable track record that has resulted in access to cheap equity capital. That being said, conservative investors must appreciate the cyclical nature of this industry, in which investment income comes in booms and busts based on the strength of the economy. The company’s relatively high payout ratio, meaningful financial leverage, and dependence on capital markets increase dividend risk during downturns, so any position in Main Street should be sized appropriately. That’s especially true given Main Street’s new plan to roll its supplemental dividend into its regular monthly payout by 2024. The firm’s new capital allocation strategy could expose the dividend to greater risk of a cut during future recessions since the supplemental dividend is funded out of more volatile and economically sensitive capital gains and dividends generated from equity stakes in its customers. For now, however, management deserves the benefit of the doubt. 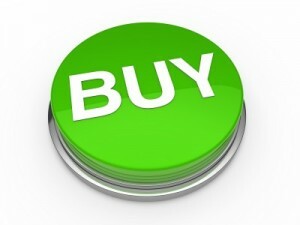 ← Should You Invest in Dividend Stocks or Dividend ETFs?